In yet another high profile clash that we keep seeing among big companies, Apple has just slapped two law suits against Motorola over six multi-touch patents which Motorola is allegedly infringing upon in nine different handsets. 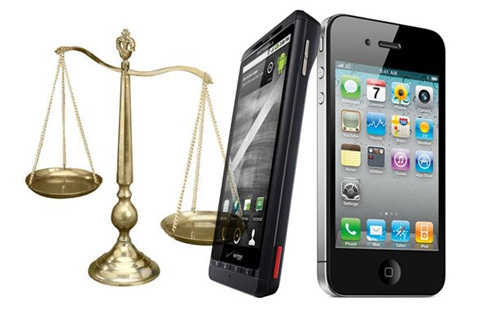 These law suits are a major counter punch from Apple as Motorola recently sued them over 18 infringed-upon patents. Apple has named Droid, Droid 2, Droid X, Cliq / XT, Backflip, Devour A555 / i1 and Charm 1 in the list of devices which infringe Apple’s patents. The following information pertains to six granted patents listed in Apple’s two distinct lawsuits. One: Apple, Inc patent titled: Ellipse Fitting for Multi-Touch Surfaces: Patent Abstract: Apparatus and methods are disclosed for simultaneously tracking multiple finger and palm contacts as hands approach, touch, and slide across a proximity-sensing, multi-touch surface. Identification and classification of intuitive hand configurations and motions enables unprecedented integration of typing, resting, pointing, scrolling, 3D manipulation, and handwriting into a versatile, ergonomic computer input device. Two: Apple, Inc patent titled: Multipoint Touchscreen: Patent Abstract: A touch panel having a transparent capacitive sensing medium configured to detect multiple touches or near touches that occur at the same time and at distinct locations in the plane of the touch panel and to produce distinct signals representative of the location of the touches on the plane of the touch panel for each of the multiple touches is disclosed. Three: Taligent, Inc patent titled: Object-Oriented System Locator System: Patent Abstract: A method and system for adding system components (documents, tools, fonts, libraries, etc.) to a computer system without running an installation program. A location framework is employed to locate system components whose properties match those specified in search criteria. The framework receives notification from the system when system components whose properties match the search criteria are added to or removed from the system. Four: Apple, Inc, patent titled: Touch Screen Device, Method, and Graphical User Interface for Determining Commands by Applying Heuristics: Apple’s invention generally relates to electronic devices with touch screen displays, and more particularly, to electronic devices that apply heuristics to detected user gestures on a touch screen display to determine commands. Five: Apple Computer, Inc. patent titled: Method and Apparatus for Displaying and Accessing Control and Status Information in a Computer System: Apple’s invention generally relates to the field of computer systems; particularly, the present invention relates to displaying a status and control function bar or window to enable access of user selected indicia to a computer system user. Six: Apple Computer, Inc. patent titled: Support for Custom User-Interaction Elements in a Graphical, Event-Driven Computer System: Apple’s invention relates to graphical, event-driven computer systems, more particularly to custom interactive user-interaction elements in a computer system having a window-based graphical user interface. all damages adequate to compensate for Motorola’s infringement and in no event less than a reasonable royalty for Motorola’s acts of infringement. It’s obvious that if Apple wins the case, Motorola will have cough up quite a few million bucks to get off the hook. It’ll be interesting to see the proverbial clash of the titans if the case indeed goes to trial. Stay tuned for more.